Clayton Kershaw allowed only an unearned run and three baserunners in three innings with three strikeouts. Trayvon Robinson had a fourth-inning triple that gave the Dodgers the lead for good. Jamie Hoffmann singled, doubled, scored and drove in a run. Kershaw, Dioner Navarro and Justin Sellers made errors in a grotesque third inning. Travis Schlichting gave up three runs on four baserunners in an inning of work. Kershaw walked leadoff batter Juan Pierre, who was then caught stealing. There were more remembrances of Duke Snider, including these from Jay Jaffe, Ross Newhan and Ross Porter, who transcribes an old interview with the legend. Spring training continues to make for colorful departures, as this chronicle of Matt Kemp’s attempted exit from Diablo Stadium by Roberto Baly of Vin Scully Is My Homeboy shows. Paul Francis Sullivan chronicles for the Hardball Times the many paths that former Dodger (and former nearly everything) Mike Morgan crossed. But there is a solution, it seems to me. The Angels now, granted Mr. Grba is a first-class pitcher even if his name sounds like something that a space chimp might say upon landing, should shop around not for a player or two but a vowel or two. White Sox at Dodgers, 12:05 p.m.
Harry How/Getty Images Matt Kemp and Marcus Thames feel fine in the sunshine. Looking to return to form and function, John Ely faced eight batters and allowed one hit, striking out three and walking none. The Dodger bullpen followed with seven shutout innings from Mike MacDougal, Blake Hawksworth, Kenley Jansen, Ramon Troncoso and Jon Link. Two hits from Rafael Furcal in his Spring Training debut. Jamie(Jamey)’s got a glove: Diving defensive plays from Jamey Carroll at short and Jamie Hoffmann in left field. Rod Barajas hit the Dodgers first homer of the spring. I didn’t see the play, so I don’t know how bad it was, but after hitting a two-run single in the first inning, Matt Kemp was picked off. Something for him and Davey Lopes to talk about? Andre Ethier struck out in both his at-bats. Barajas was this close to becoming a Toronto Blue Jay before the Dodgers signed him (following Russell Martin’s departure) this winter, writes Tony Jackson of ESPNLosAngeles.com. Sue Falsone, who became the first Major League Baseball female physical therapist in 2007 with the Dodgers, is now only working with the team as a consultant, while remaining a liaison for the Dodgers and Athletes Performance Institute. Jeremiah Randall will be the Dodgers’ new major-league physical therapist, the team said today, while Nancy Patterson is now the team’s assistant athletic trainer. Patterson previously worked for the organization with Inland Empire and Chattanooga, as this 2010 article by the Chattanooga Times Free Press notes. 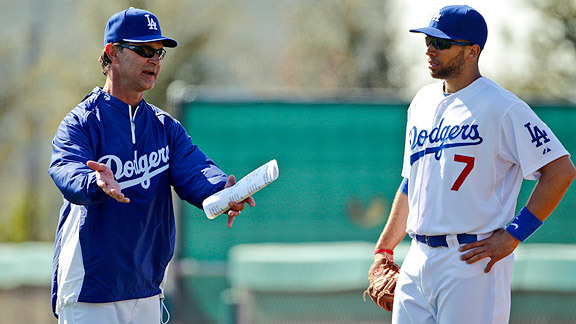 Randall was the Dodgers’ minor-league rehab coordinator for 2010. Stan Conte remains director of medical services and head trainer. 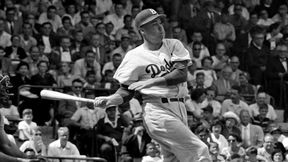 A combination of nostalgia for Duke Snider and this being the night of the Oscars has made me want to call back this post I wrote in 2005 about my favorite movie, “The Misfits.” This month marks the 50th anniversary of its release. … Time and again in tense physical and emotional struggles, “The Misfits” takes the guileless idealism that we are born with, tears it down, and then rebuilds it. It shows how crushing the disappointment can be when the world does not live up to our expectations, and yet how few of us can resist trying to reinvent the world so it will. It shows how flawed we are and yet how sympathetic, how deserving of rescue, we can be. It shows the battles of our lives. And here are obituaries from The Associated Press and the Times. 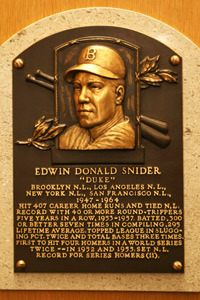 Duke Snider joined the Hall of Fame in 1980. Edwin Donald Snider gets third billing in the Terry Cashman song, “Willie, Mickey and the Duke” – a placement that seems to celebrate as well as diminish his legacy. Snider was one of the greatest center fielders of all time, up there with Willie Mays and Mickey Mantle, but he was forever proving himself, to the Dodgers and to baseball history. “Duke was so talented, and he had a grace about him,” said his Dodger roommate for 10 years, Carl Erskine. “They talk about (Joe) DiMaggio and how he carried himself on the field. … His outfield play and his running the bases and his trot for the home run, he just looked class, man. AP Taking his cut, c. 1950. Ultimately, like the way he climbed that Ebbets Field wall to save the game against the Phillies, Snider reached magnificent heights. 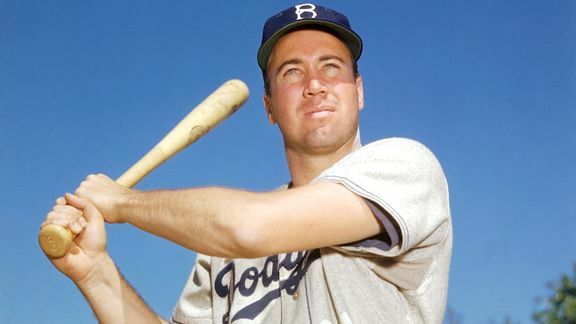 He had eight full seasons and two partial seasons with EQAs of .300 or better, more than any other Dodger ever. He had at least 40 homers in the Dodgers’ five final seasons in Brooklyn, and a career .295 batting average, .380 on-base percentage and .540 slugging percentage. He hit an all-time Dodger record 389 homers. The Duke was much, much more than a name in a song. This is a tectonic passing. The Duke is iconic, a legacy carved in granite. We will truly miss you. 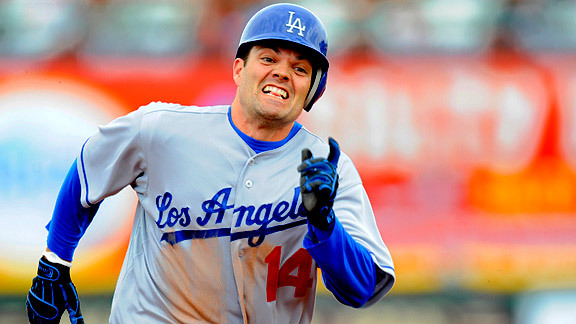 Rob Tringali/Getty Images James Loney and Jamey Carroll run, run like the wind, run like the wind. Jackie Robinson’s 1946 Montreal apartment will be commemorated in a ceremony Monday, reports the Canadian Press (link via Baseball Think Factory). Once again, Andre Ethier has scored low in a defensive rating – this time David Pinto’s statistical assessment of right fielders from 2006-10 at Baseball Musings. Nice feature on Bill James from Derrick Goold of the St. Louis Post-Dispatch (again via Baseball Think Factory). Beware of cactus at Salt River Fields, new Spring Training home of the Arizona Diamondbacks, notes Nick Piecoro of the Arizona Republic. Above – Tony Jackson of ESPNLosAngeles.com interviews Jerry Sands. Matt Kemp hustled his way to a second-inning run, as documented by Craig Calcaterra of Hardball Talk. Hiroki Kuroda faced the minimum in two shutout innings, and dual starter Tim Redding crawled out of his sickbed to throw two scoreless frames himself. 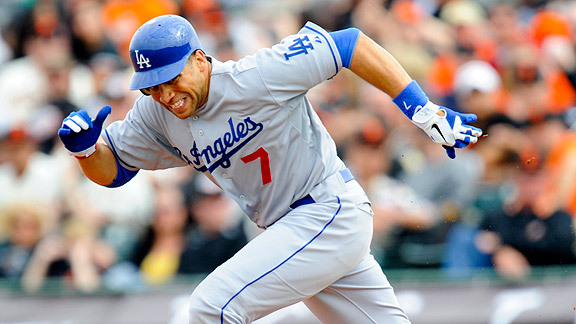 In 18 innings spread over two games, the Dodgers drew two walks, though they did rack up 15 hits against the Giants. Carlos Monasterios and Oscar Villarreal each gave up four runs in an inning. Facing mostly Angels starters, Rubby De La Rosa was one out away from completing his second shutout inning when he gave up a two-run homer to Mark Trumbo. Calacaterra has a photo of the funny midgame path some Dodgers took after their work was done against the Angels. A total of 50 Dodgers played today: 25 in each game. Update 2: Both Tony Jackson of ESPNLosAngeles.com and Ken Gurnick of MLB.com have pieces on Scott Elbert. Update 3: The agony and the ecstasy. Dodgers at Angels, 12:05 p.m.
Dodgers at Giants, 12:05 p.m.
For your morning reading pleasure: Howard Cole of Baseball Savvy has a nice interview with uber-fan blogger Roberto Baly of Vin Scully Is My Homeboy. Pennant Preview from Steve Varga on Vimeo. While folks are talking about the arrival of the 2011 version of the MLB At Bat mobile application, which is fairly indispensable in my world, there are other new portable treats out there. One is the historically oriented “Pennant” for the iPad, illustrated in the clip above. If you sit through the whole demonstration, you might find it more than a little bit cool. In addition, the Bill James Baseball IQ App has just been introduced. What other baseball apps have you guys used? Anyone have the Fangraphs app? Andre Ethier and Ivan De Jesus Jr. are the main subjects of Tony Jackson’s notebook today for ESPNLosAngeles.com. Joe Torre is expected to be named Major League Baseball’s executive vice president of baseball operations Saturday, reports The Associated Press. Adrian Beltre’s Texas career is off to a sluggish start — he’ll miss a couple of weeks of Spring Training games with a calf strain, reports Richard Durrett of ESPNDallas.com. John Kilma writes about “the new generation of pitching that is quickly accelerating college baseball’s role as fertile ground for professional pitching development “for ESPNLosAngeles.com. The first Spring Training radio broadcast is Saturday at 12:05 p.m. Pacific on KABC 790 AM. The first Spring Training telecast is Sunday at 12:05 p.m. Pacific on Prime Ticket. 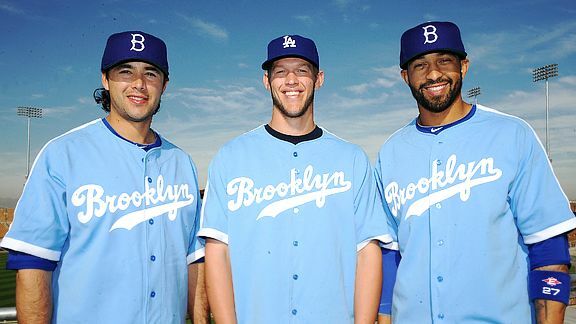 These 1940s Brooklyn road uniforms will be worn by the Dodgers at six midweek day games in 2011. Each of the games will feature half-price food and drink, including alcoholic beverages, for the first time ever at Dodger Stadium, with a special half-price six-game ticket plan available for fans who want to attend each of the games. Nearly 50,000 votes were cast at dodgers.com/throwback with the winning uniform edging out the 1911 road uniform by less than 2,000 votes. Though the original uniform worn in the 1940s was made of a highly reflective satin fabric to make it more visible under the lights for night games, the throwback jerseys will maintain a similar feel as those worn by the Dodgers throughout the 2011 season. 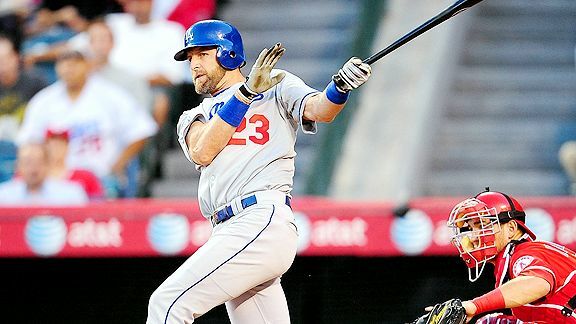 One of the many mantras of the 2011 preseason has been the Dodgers’ determination to get more rest this year for Casey Blake, who turned 37 in August. That made me curious as to whether Blake (whom Tony Jackson wrote about Thursday for ESPNLosAngeles.com) actually performed better when rested last year. And the short answer is, he didn’t. I went through the 2010 game logs, and here’s how Blake performed. Total: 146 games, 571 plate appearances, .320 OBP, .407 slugging percentage, .727 OPS. No days off: 110 games, 425 plate appearances, .332 OBP, .397 slugging, .729 OPS. One or more day off: 33 games, 138 plate appearances, .275 OBP, .364 slugging, .639 OPS. First of all, I’m not going to pretend that a .727 OPS is what the Dodgers want out of their third baseman. But it’s hard to say that rest made it any better. This data doesn’t take into account matchups or game conditions, and it’s certainly susceptible to small sample size issues. But at a minimum, it should make people think twice about how much days off actually helped Blake. Not that I’m suggesting that he play 162 games, but it’s fairly easy to posit a theory that frequent play keeps Blake’s batting eye honed in. Or, that rest just isn’t that much of an issue, and the Dodgers should just shrug their shoulders and play him when they have no better option. How often will Juan Uribe at third base and someone like Jamey Carroll (.380 OBP vs. righties last year) at second base be a better combination? You tell me. … The surgery was performed in Los Angeles by team physician Dr. Neal ElAttrache and Dr. Steve Shin, who conveyed the results to Dodgers trainer Stan Conte at Camelback Ranch. Update: The Dodgers “plan to add one more Cactus League game to their schedule to be played sometime in late March in Tucson, Ariz., to benefit the Christina Taylor Green Memorial Fund,” according to Tony Jackson of ESPNLosAngeles.com.